Rising sophomore of the Haliwa-Saponi Indian Tribe, Dominecha Crenshaw, is making the most of her experience as a student at UNC-Chapel Hill. This past year, she conquered her nervousness to fly and pursued her dream of studying abroad. 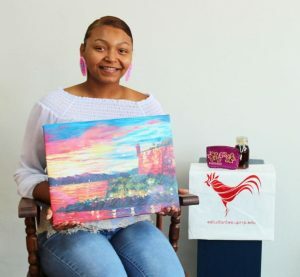 Dominecha’s journey (pictured below) began when she saw a posting about the Global Take Off: Puerto Rico Program offered within the Fed Ex Global Education Center. Her curiosity rose as she realized her dream of studying abroad could become a reality. 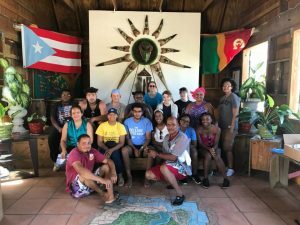 Soon after, Dominecha found herself traveling with other UNC students to Puerto Rico to participate in a five-day interactive educational experience. Together, they engaged in discussions with Puerto Rican students and community members. They toured local sties and community organizations. While there, Dominecha grew professionally and personally, as she assisted with hurricane recovery efforts that were initiated after the devastation left behind from Hurricane Irma and Maria. She distributed goods (food, hygiene products, clothing, etc.) to the locals that were previously collected by the UNC Community. She was exposed to Puerto Rican culture and history. In an article recently published in her hometown, it was said that Dominecha “found that language barriers are easily overcome through a spirit of friendship” and that this trip changed Dominecha’s perspective and has inspired her to travel to other countries to help people. To read more about her story, visit http://www.warrenrecord.com/news/article_3e89a812-8a86-11e8-b076-f3b002df7480.html. Dominecha is perusing a degree in nursing with hopes of becoming a nurse practitioner. 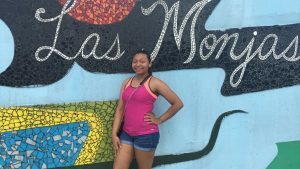 She encourages other students to participate in study abroad opportunities. To learn more about the Global take Off: Puerto Rico program that she participate in, please see the information below and follow the link provided. Global Take Off: Puerto Rico deadline approaching! New to UNC? Whether you’re a first-year or a new transfer, if you have limited travel experience and financial need, you’re eligible for Global Take Off: Puerto Rico! 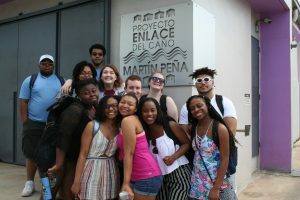 This fully funded program includes a five-day immersive experience in Puerto Rico over winter break. Ten UNC students will be selected to participate, and applications are due July 29! Learn more about the program, and start your online application today!